Not sure why the toad of toad in the hole is called a toad so I’ll call my new dish what it is…egg in a pit. It’s not eloquent, but it’s not a lie like that lying toad in his fabricated hole. Come to think of it, do toads even hang out in holes? Maybe a pile of mud, or a stream, or a riverbank? I don’t know too much about toads, but I know that’s not what’s in the middle of a scooped out piece of bread. Toads give warts and bad suitors turn into them…what part of any of this do you want in your breakfast??!?! I like simple breakfasts. Scrambled eggs are perfect. An omelette is a great post workout dinner. But all of these lox clad eggs or Benedicts made with the finest regional meats and crabs and fishes freak me out a little. That’s why I’m always looking for simple twists on basic breakfast. It’s what I like. A tablespoon of cream cheese and chives stirred in at the end of a scramble is a nice addition. So is an omelette of tomato, cucumber, and feta topped with tzatziki, a recent find I’ve made a few times. Breakfast casseroles are great for company, so what’s my next twist on eggs? You take an egg. And you crack it into a pit. That’s when it occurred to me I could just make a square. So I made one of those too. 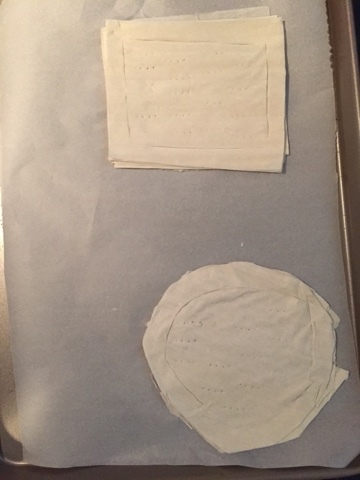 You’re going to want to score a 1/2″ border, or whatever you want to puff up when baking and then make your “pit” by stabbing the center repeatedly with a fork. 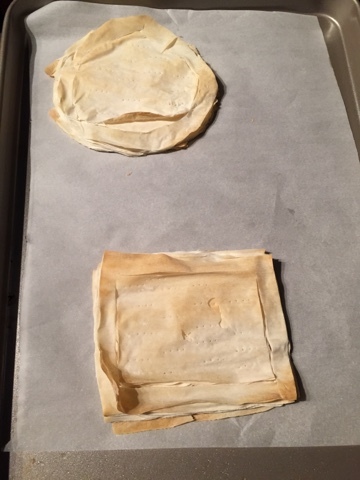 Place your phyllo pits on a parchment covered cookie sheet in the fridge until the oven heats to 400. 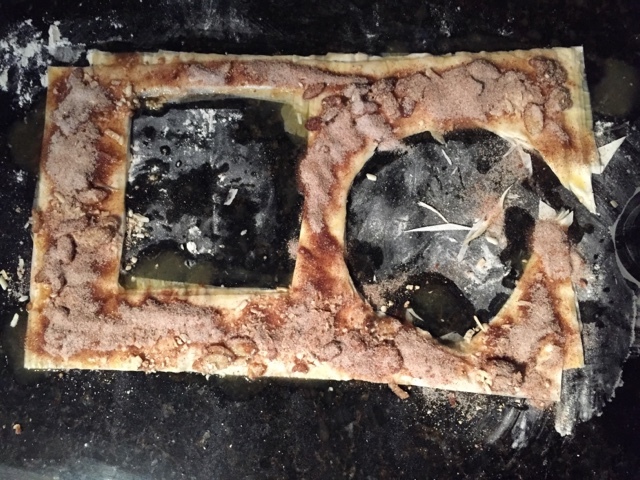 Transfer the cookie sheet from the refrigerator and bake for 8 minutes. Now if your pits aren’t deep enough, rip out a few layers and discard. Careful not to burn your fingers…it’s steamy in the pit. Sprinkle some cheddar cheese in the bottom of the pit, then crack an egg on top of the cheese. Sprinkle with salt and pepper, then bake until the egg white is cooked, around 12 minutes. Voilà! 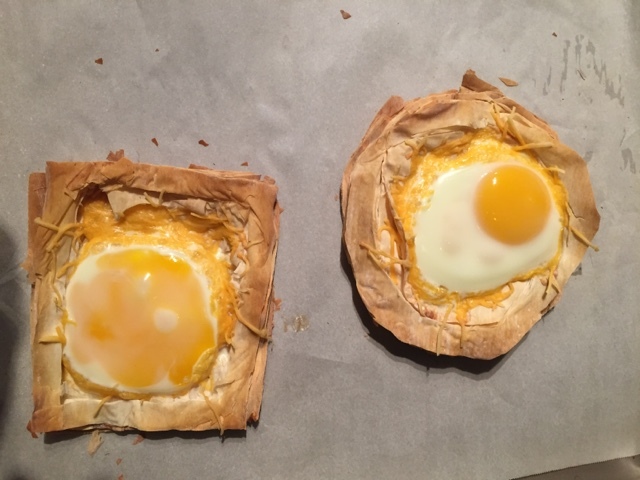 Egg in a pit! Circle clearly wins on beauty here. 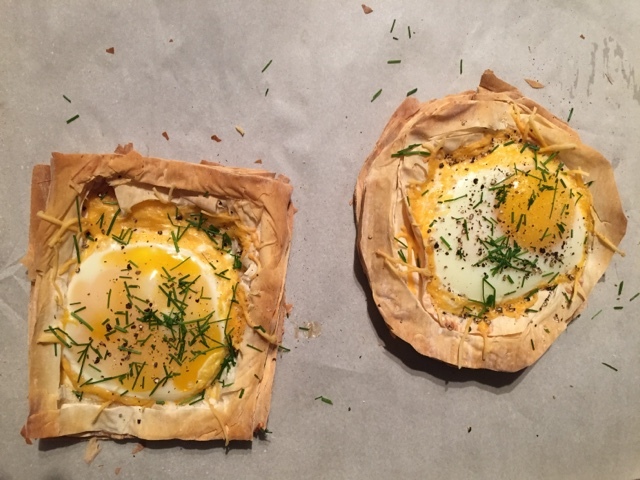 Your guests won’t notice if your yolk broke, talking to you square, if you top it with enough chives. 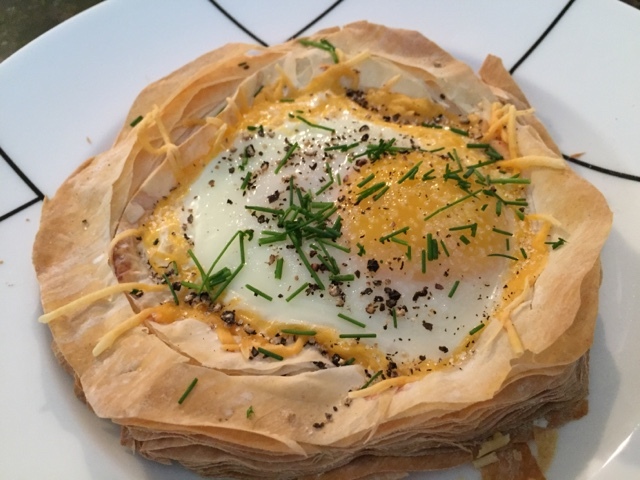 Now, breakfast is complete, but you have a strange shaped puzzle of phyllo on your counter…what to do with it?? Phyllo is not cheap people! 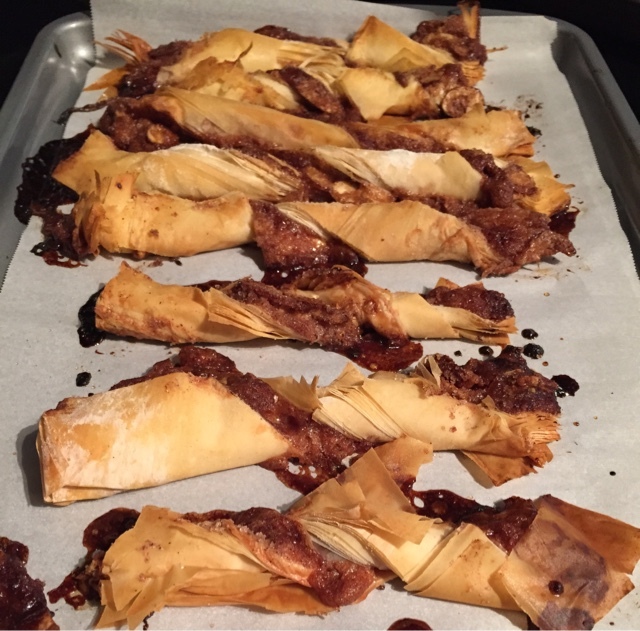 I’m not made of phyllo! 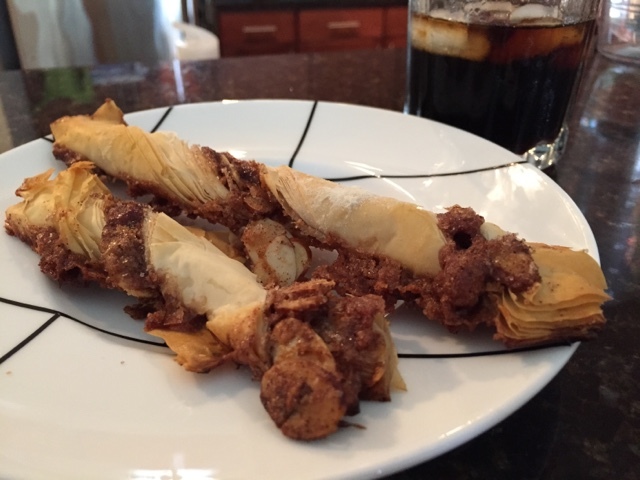 Even though I’ve been attempting to cut sweets, I decided to make cinnamon twists with the carnage. All you really need is a few tablespoons of melted butter (brush that on your phyllo) and cinnamon sugar to sprinkle on top. 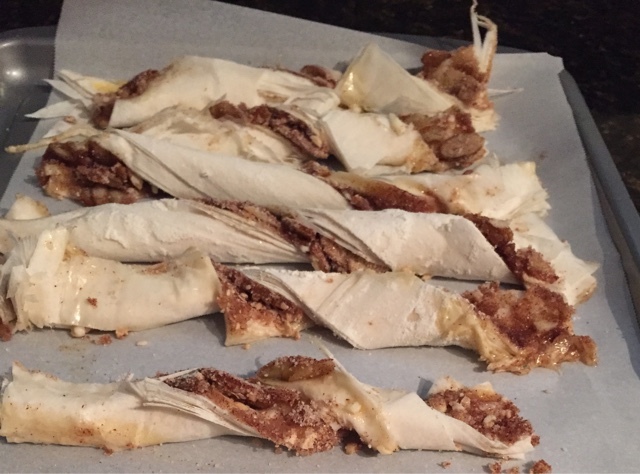 I was cleaning out my cabinets and had the remnants of another baking adventure, so I also added some almonds I’d candied and some white chocolate shavings. Why not? Then all you do is pizza cut the tenant into strips and twist! Bake for about 18 minutes, don’t let the sugar burn, and enjoy your treat with a glass of iced coffee. Ok, so I really must work on my food photography. I promise they don’t look so much like a giant joint oozing poo in real life. Bon Appetit!